Rajesh Thomas started working as a Research Fellow in the group of Dr. Lifeng Liu in August 2017. His research work in this group focused in the areas of energy storage based on Sodium ion batteries. 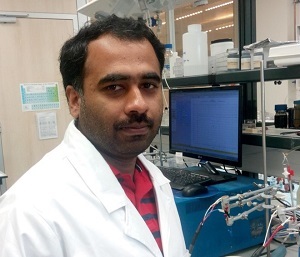 Previously he worked in the group of Prof. Pedro da Costa at KAUST, Saudi Arabia as a postdoc fellow. The work involves the fabrication of Al ion battery and the setting up of a CVD reactor for graphene/CNT growth. Rajesh completed his PhD in material science from Indian Institute of Science, Bangalore in the year 2014 under the supervision of Prof. G Mohan Rao. His PhD thesis is on Li ion battery materials especially the anode part. During his PhD, he worked mainly on the material synthesis and assembly of Li ion battery. The materials were synthesized via PVD, CVD and chemical methods.